IS COMPASS WEALTH YOUR BEST CHOICE? We know you have choices when you select a financial advisor. Read our Top Ten Reasons why you should select Compass Wealth LLC. to help you achieve your financial goals. Compass Wealth is an independent financial firm. We are not owned by a bank or insurance company that requires us to recommend proprietary products. At Compass Wealth your financial advisor not a salesman. There are no layers of management that tell us what to recommend to our clients. Compass provides integrated solutions that include: Financial Planning, Investing, Risk Management, and Tax with Chapman & Co. PC. 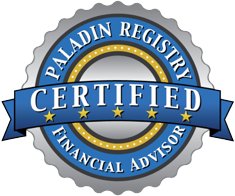 Paladin is the only SEC registered firm that vets and rates the quality of financial advisors and firms. Compass Wealth received a 5 star quality rating from Paladin. Financial advisors pay a fee to Paladin for this service. In 2009, our founder was also named One of the 50 most experienced independent financial advisors by BusinessWeek magazine judged from a pool of more than 1,000 Paladin Registry advisors and scored on a 100 point basis. Rob Chapman acts as a financial fiduciary when he provides advice and services for fees. Fiduciaries are held to the highest ethical standards in the financial service industry. We believe investors deserve a level playing field when they select financial advisors and firms. We practice “voluntary” transparency for the information you need to make the right decision when you select a financial advisor. Rob Chapman prefers to be compensated with fees, the same way you pay other professionals (CPAs, attorneys) you depend on for specialized knowledge and services. Some services are compensated with commissions. We understand every dollar of expense is one less dollar you have available for reinvestment and your future use. Our goal is to deliver competitive results for reasonable amounts of expense. Timely communication is part of the foundation that we establish with each client. You tell us the frequency of communication that works best for you. We utilize large, highly regarded custodians for your assets. They include AssetMark, Charles Schwab, and Pershing.